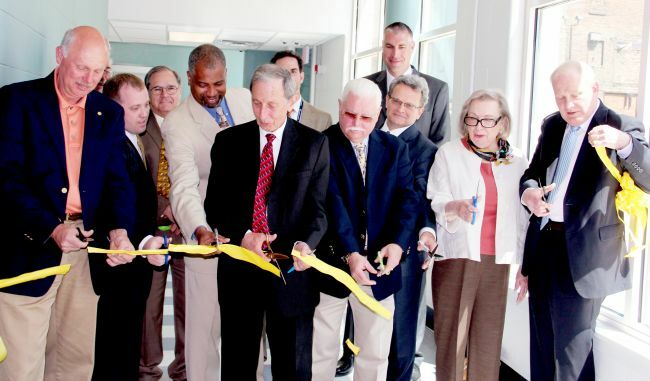 The Applied Technology Center at West Virginia Northern Community College was opened officially Monday with ribbon-cutting ceremonies at the renovated building which extends and enlarges the growing downtown Wheeling campus. The event was held just inside the front doors of the former auto showroom for Straub Honda at the corner of 16th and Market streets. Ground was broken on May 9 of last year for the $3.88 million project. Officials from the college, state, city and county participated in the event, with remarks being given by Olshinsky; James Skidmore, chancellor of the West Virginia Community and Technical College System; Dr. Darrell Cummings, chair of the WVNCC board of governors; Wheeling Mayor Andy McKenzie; Michael Koon, WVNCC vice president of workforce development; and Vic Greco, SMG Architects of Wheeling. Greco’s design for the project incorporated elements of surrounding buildings, including West Virginia Independence Hall, located directly across Market Street, and the college’s adjacent B&O Building. Low bidder of the eight firms which sought to construct the project was DeSalvo Construction Co. of Hubbard, OH. First floor of the building houses labs for welding, diesel and refrigeration/heating/air conditioning instruction along with a large classroom, offices and reception area. The second floor includes a classroom and the lab for Mechatronics, a new program that prepares students to be electrical and industrial maintenance technicians, and space for the petroleum technology program. The project was first announced on Feb. 24, 2011, when WVNCC’s Board of Governors approved a resolution calling for purchasing the three former car dealership parcels in downtown Wheeling for $1.05 million. In August of that year documents were signed officially turning over the property to the college from the Ohio County Development Authority. Funds for the purchase and renovation came from state bond money approved by the Legislature in 2008. Currently under construction is the college’s Student Union and Barnes & Noble bookstore to be located in the former Hyundai showroom across 16th Street from the ATC. It is expected to be opened in early July. The college's current facilities include the B&O Building, situated across the street from the former car dealerships, and the Education Center, the other main college building, across Chapline Street from the B&O Building.